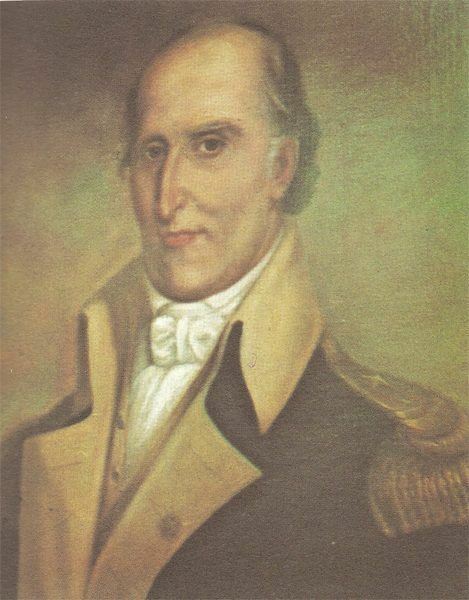 On this day in history, August 12, 1776, Andrew Pickens wins the Ring Fight, a unique battle with Cherokee Indians in South Carolina. The Cherokee tribe was spread out across the southeast through western North Carolina, South Carolina and Virginia, as well as Kentucky, Tennessee and northern Georgia and Alabama. When the American Revolution arrived, the tribe split in its loyalties, with some siding with the British and others declaring neutrality. In 1776, those Cherokee aligned with the British launched a campaign into the western colonial settlements from Georgia to Virginia. Major Andrew Williamson rallied the South Carolina backcountry militia, assisted by Captain Andrew Pickens. Eventually they gathered a force of 1100 men and began a scorched earth campaign against the Cherokee villages in western South Carolina. On August 12, 1776, Captain Pickens was leading a 25 man scouting party ahead of Williamson's main body of militia when the party was suddenly surrounded by a large group of Cherokee. The Indians had 175-200 men and easily outnumbered Pickens' small band. Pickens' quick thinking saved the day. Pickens ordered his men to form a ring, facing outwards. The men took turns shooting around the circle, while others reloaded their guns. Those Indians who approached were shot. The few Indians who did breach the circle with their tomahawks were killed as well. Eventually, Pickens set fire to a nearby sugar cane patch. As the cane burned, the joints popped, sounding like gunfire. The Indians, hearing the popping sound, believed reinforcements had arrived and fled. Shortly after, reinforcements from Major Williamson did arrive and Pickens' men survived. Believe it or not, only one of them was even injured! Numerous Indians were killed in what came to be called the "Ring Fight." After Williamson's arrival, he and Pickens led an attack on the nearby Cherokee village of Tamassee and burned it to the ground. 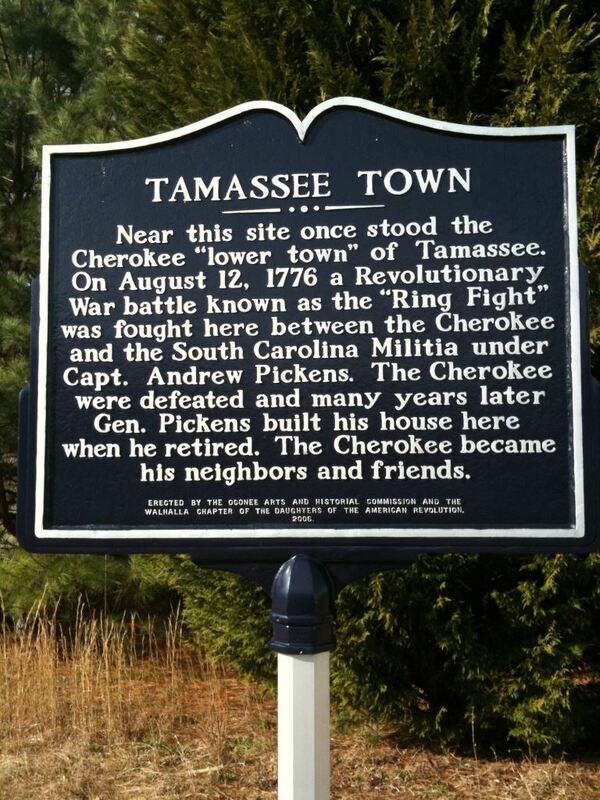 Pickens earned the respect and awe of the Cherokee for his role in the Ring Fight. After the battle, they began to call him "Skyagunsta" or the "Wizard Owl." He would serve throughout the war with great distinction and be raised to Brigadier General of the South Carolina militia. After the war, Pickens spent many years as a state representative and a few years in Congress. Later in life, he built a home called the “Red House” near Tamassee, not far from the site of the Ring Fight, where he lived until his death in 1718. Major Williamson continued to serve in the militia as well and also became a Brigadier General. After the British captured Charleston in 1780, the situation looked very bleak for the patriots and many swore oaths of allegiance to Britain, including Williamson (and Pickens). Many took up arms anyway and continued to fight, such as Pickens, but Williamson actively tried to get his fellow countrymen to renege and join the British, earning the ire of many patriots. After the war, General Nathanael Greene revealed that Williamson was actively feeding him intelligence on British activities, but this did not do much to change his reputation among fellow South Carolinians, who continued to view him as a traitor.